With the wet conditions and challenges in making dry hay this year, there’s been a lot of discussion and ink dedicated to making baleage. 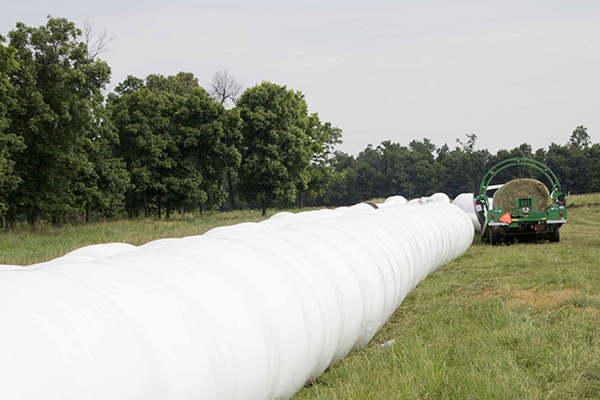 Round and square bale silage certainly has become as common as traditional silos for storing high-moisture forages. Michelle Arnold, D.V.M. and ruminant extension veterinarian, along with Jeff Lehmkuhler, extension beef specialist at the University of Kentucky, recently reminded forage producers that high-moisture bales can be at risk for clostridial bacteria growth if the pH of bales following fermentation is not sufficiently low (below 4.5). Typically, a high pH is problematic when the forage is harvested above 70 percent moisture. Spoilage may also be an issue because of aerobic degradation of the carbohydrate because of delayed wrapping or damage to the plastic covering; both allow for the introduction of oxygen into the bale. Botulism is a potent toxin produced by Clostridium botulinum, a spore-forming anaerobic bacterium. In the absence of oxygen and a pH greater than 4.5 (conditions in poorly fermented wrapped bale), C. botulinum begins to grow. The authors recall a situation in Kentucky during December 2009 when 90 stocker calves were lost to botulism after consuming some poorly fermented oatlage (pH of 6.8). Small grain silages like rye, oats, wheat and barley are often the most challenging to ensure a good fermentation. Typically a large number of animals are affected all at once. Progressive muscle weakness. In worst-case scenarios, animals go down. This may occur anytime from one to 10 days after toxin ingestion. Decreased tongue-tone, which is the classic feature of botulism. The tongue may actually hang from the side of the mouth. Without tongue control, the animal may also have a dirty nose and difficulty in chewing and swallowing. Constipation and raising the tail while straining. Death due to paralysis of the muscles of the diaphragm. Finally, the authors point out that thousands of bales are wrapped each year with very few incidents of botulism occurring; the risk is low in the vast majority of situations. However, if there is a concern about fermentation because of high moisture and/or type of crop, the prudent action is to test the forage for pH before feeding.